Know that Within 30 Days 80% is Forgotten – comes from the Free Guide – ‘Are you frustrated by training that creates short term interest but not long term change?‘. In the mid-1800s, a German Psychologist carried out a series of tests on himself to understand how much he remembered over time. He used 3 letter cards and plotted his research. His name was Hermann Ebbinghaus and his research became known as the ‘Forgetting Curve’. The day after the training, ask the Learners to teach someone else one thing that they learnt at the event. 10 days after the training, suggest that the Learners make a diary reminder to re-write their notes. 30 days after the training, email the Learners a task related to the learning. 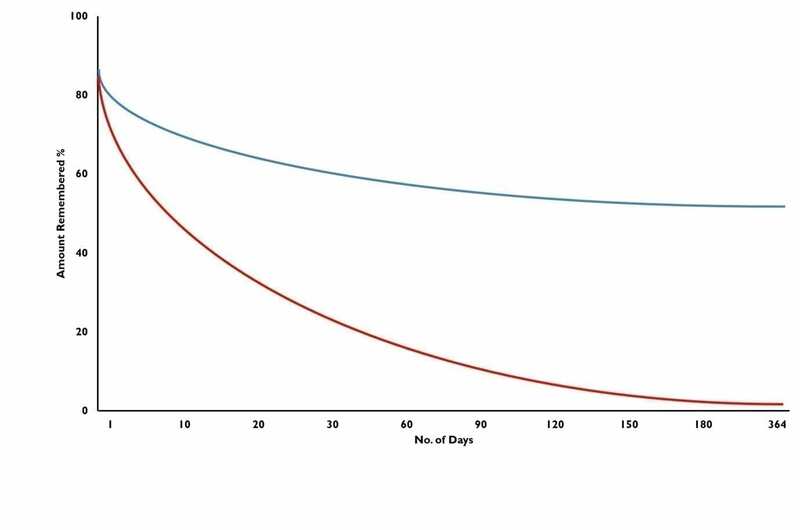 Ebbinghaus’ Forgetting Curve and the Spacing Effect were large contributors to designing Sticky Learning ® because we wanted scientific research to be the driving force behind how we learn best.